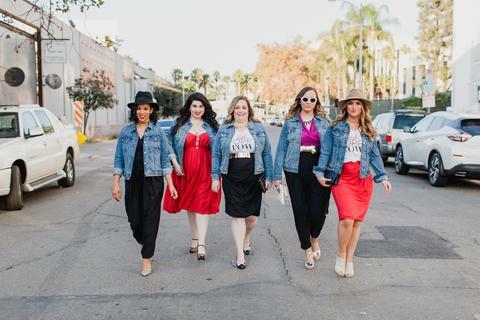 Poppy Row founder Crystal Cave comes from a long line of entrepreneurs, but it was a personal health crisis that inspired the celebrity stylist to follow her childhood dream to become a fashion designer. In a time when fast throw away fashion chains grow quicker than stores can clear their racks, Crystal’s new line promises something different: beautifully designed closet staples that are sustainably and ethically made. As an ethical fashion stylist myself, I couldn’t wait to hear about her new collection. In fact, I had such an awesome time chatting with Crystal, I ended up with way more content than really made sense to turn into a written interview. I did something a little different this time; below in the text, you'll find some of the really nerdy design Q&A stuff. But in the link I'm about to share right after this paragraph, you'll find...wait for it... the first ever Style Ethic podcast episode! Holy moly! Did I mention my nickname used to be Kermi? Now you know. Why did you want to start an ethical brand? When I was in design school in Italy, I watched The True Cost – which for me was very mind-blowing – and it was actually so heavy I couldn’t even fully comprehend everything until I just started doing some more research. "We as humans are the keepers of the Earth, ultimately." And also a human being, people working in sweatshop conditions and not being paid a livable wage – to me, those are things that fundamentally is more important than any price. I really care about humans being treated properly and well, and being appropriately compensated for their skills. I’m a third generation entrepreneur and my grandfather started a large music chain when I was younger, and I saw the consumer aspect of things and how consumeristic people can get. But I also always saw how my grandfather really valued everyone who worked for them, and they had thousands of employees. People really respected him, and he taught me by example that the people who help you create your vision in the world and help implement it need to be treated well. Not gonna lie. I already pledged for that pants, honeys. Why did you choose to make your clothes in the US? As I’ve really been exploring different production partners, it’s really interesting the different people you come across. What I think is fortunate is that I am here in LA and I can go visit people in person, and I actually visited a place in Austin, as well. I think we need to bring more stuff to the US. We aren’t going to survive as an economy if we’re outsourcing everything. We’ll just become a bunch of creatives and paper-pushers. And if you think about it, if you’re shipping things from overseas, that’s going to have an impact on the environment, as well. Who doesn't love a wrap? Wrap skirt! Wrap shirt! She even has a wrap dress! Are you able to talk about your fabrics and why you chose them? It was like three months for me to figure out fabric. I looked into a few different types of fabrics and all are made in Los Angeles, actually. I’ve been to some seedy parts of LA, I must say! I can’t speak so much to the actual process, but even the dyes are more sustainable and they do the dyeing in-house. That does mean for me that there’s a minimum I have to meet, but I have found that most places are willing to work with you. All of these fabrics are 90% modal* and 10% spandex, and it feels silky with a sueded finish. I have found through testing that even when you wash it, the sueded finish is a bit more durable, too. Want more? Scroll back up to listen to the FIRST EVER Style Ethic podcast! Holy crap! I did that! Her Kickstarter runs through March 1, so go pledge now!